Werner's Cairns blog: The fluoride truth, conveniently & steadfastly ignored by the Queensland government. The fluoride truth, conveniently & steadfastly ignored by the Queensland government. 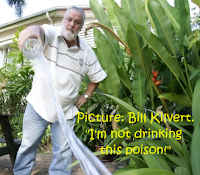 Bill Kilvert is an ardent opponent of water fluoridation; he is a life member of the ALP (Australian Labor Party) a former trade Union official, the chairman of the Cairns Anti Fluoride group and the North Queensland Co-coordinator of the FAR NORTH QUEENSLAND BRANCH of QUEENSLANDERS FOR SAFE WATER AIR & FOOD INC. Click on pictures to enlarge! The mandatory water fluoridation of our drinking water in Queensland is a constantly simmering topic. Bill is continuously running into a brick wall with the Queensland Labor government – his pleadings against this toxic additive are ignored. This is not a very rewarding treatment of a long-time loyal party member! www.fluoridealert.org/videos1.html ). These are a fantastic tool to use with your networks as they do not take up too much time and just about all of the presenters are professionals and have a good strong message. One of these is a presentation from the "Today Tonight" program from South Australia and it features Dentist Andrew Harms, who was a former President of the Australian Dental Association, and now is opposed to water fluoridation. The Health Departments and Members of Parliaments, cannot understand why the people still oppose fluoridation after 50 years and countless millions of dollars of propaganda barrelled at them. The answer is simple........TRUTH & FACTS. These videos will spread the message. Please join us and spread the message to your contacts and your local MPs. More bad news: Story on Mystery Substance Distracts from Fact Fluoride is a Deadly Killer. Click here to read about it. Videos here. Werner, I have been a swinging voter, but voted mostly for the conservative side of politics. All my children have grown up in non-fluoridated Cairns and all have healthy teeth, due to a good diet and brushing teeth. There was never a need to mandate fluoride and now I have the extra expense of getting filters to remove this toxic poison – we are not pleased. You talk about the coming election and want answers from the LNP in particular, well; I’d advice you not to hold your breath. With Langbroek at the helm of the LNP, an ardent advocate of fluoridating our water, my family and friends will vote for whoever will state that they will overturn mandatory fluoridation, give people a choice and return to a democratic government system in Queensland when the will of the Queensland people is taken in account. If the LNP wins the next election it will be by default – because the Labor party has lost. So it is very important to look for good independents so that the LNP will need them for getting legislation through – if they win with a large majority they will treat us with the same contempt just as the Labor party is doing it now. The LNP should consider bringing Springborg back to lead the LNP; he is a much better parliamentary performer, unlike the wishy washy Langbroek. And finally, you have a very interesting blog, I enjoy reading it, keep up the good work. Werner, thank you for your very interesting blog, I visit it daily, keep up the good works. The war on terrorism is “hotting “up! The Aussie barbecue, operated by men!